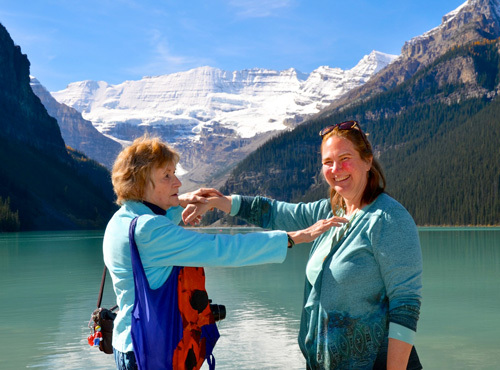 Jan Cole, left, and Joy Connor, in front of the beautiful alpine Lake Louise located in Banff National Park, Alberta Canada. 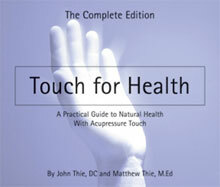 Both Jan and Joy are former presidents and board members of the Touch for Health Kinesiology Association in the U.S. They are also TFH Instructors and have contributed immensely to TFH and TFHKA over the years. Jan was president of TFHKA for four years, a seven-year board member and an instructor since 1977. The photo was taken by Govert van Ginkel from The Netherlands. 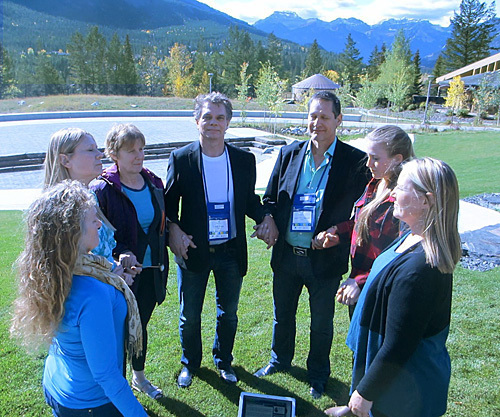 The trio were attending the International Kinesiology Conference in the beautiful Canadian Rockies in Alberta. A big thank you to our Canadian friends and hosts! 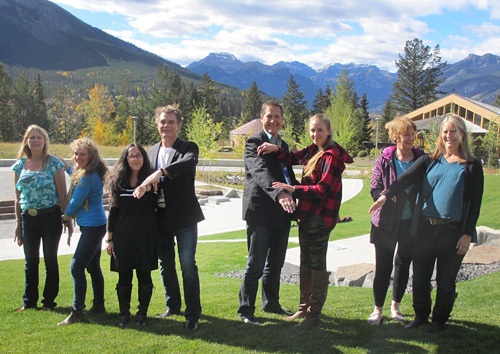 It was a great conference at Banff Centre in one of the world’s most beautiful locations in Banff, Alberta, Canada. After serving as an international lecturer and a Doctor of Medicine for 40 years, Bruce has retired from active practice. 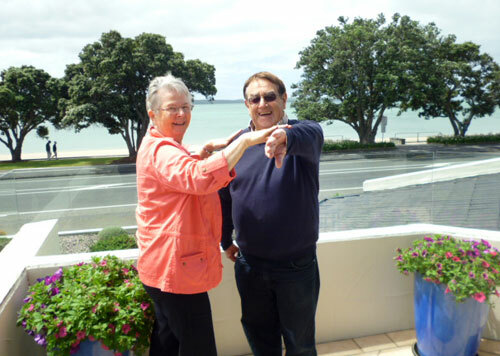 Bruce Dewe and Glenys Leadbetter balancing on the edge of Auckland's, Waitamata Harbour, New Zealand. It is New Zealand's main access by sea. The decision to locate the capital here was heavily influenced by the habour's deep navigable channels and sheltered bays which protects it from storms. A long-time contributor to the Touch for Health model, Dr. Dewe is recognized as one of the Founding Fathers of Kinesiology. 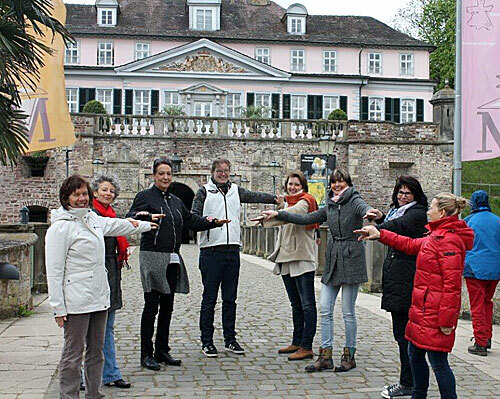 As chairman of the Touch For Health International Faculty he was instrumental in setting up the International Kinesiology College, in Zürich, Switzerland of which he was the first President. He and his wife, Joan, founded the International College of Professional Kinesiology Practice (ICKP)in 1998. The course material of the ICKP is based on the Professional Kinesiology Practice workshops (PKP I-IV)developed by the Dewes. These have been taught in 20 countries and translated into 8 languages. Here we are balancing in front of Lovely Lane Chapel at Epworth By The Sea Methodist Center. The retreat and museum are located on Georgia’s St. Simons Island. Epworth is named in honor of the boyhood home of John and Charles Wesley, founders of Methodism. The circuit-riding preacher, John Wesley, is said to have ridden 250,000 miles on his horse and delivered 45,000 sermons. Methodism is of interest due to the fact that John Thie was and, to this day, Carrie Thie, is very active in the Malibu Methodist Church in California. Carrie’s grandfather was a Georgia Methodist minister and Earl’s ggg-grandfather was the first ordained pastor at the church now known as the Mother Church of Georgia Methodism. Earl made a presentation at the Methodist Museum on his theories of how the Methodists were involved in the Western Expansion and the opening of the West. 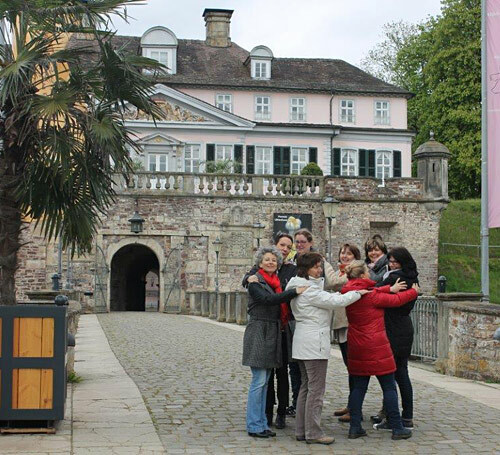 Andrea Biere and her students from Touch for Health 3 are practicing their balances in front of the beautiful Bad Pyrmont Castle in Germany. It was built in the Baroque age in the 16th century with a fortress with moat, ramparts, casements and corner bastions. Bad Prymont is known for its healing springs. Many events are held in the castle courtyards which is perfect for outdoor events. The grounds are a lovely park with many old trees. Please send us your Balancing the World photos!